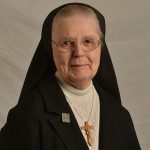 Sister Cyrilline Biel, 86, entered the Sisters of Saints Cyril and Methodius in 1950. The community’s motherhouse in Danville, Pennsylvania, was a long way from her childhood home of Whiting, Indiana. “I’d never seen any mountains until I came here,” she remembers.